One of the great strengths of planning in the SASP R/3 CO module is the similarity between actual postings and plan postings.Plan postings are basically a simulation of actual postings.Once you learn plan or actual techniques, that learning is easily transferred.Each template contains columns for plan calculations and columns for actual calculations. The target = actual method would be a viable option to use only when the planned allocations are known to be correct with a high degree of certainty.Resource allocations based on a cost flow only, no quantity flows, can be done using assessment or distribution. 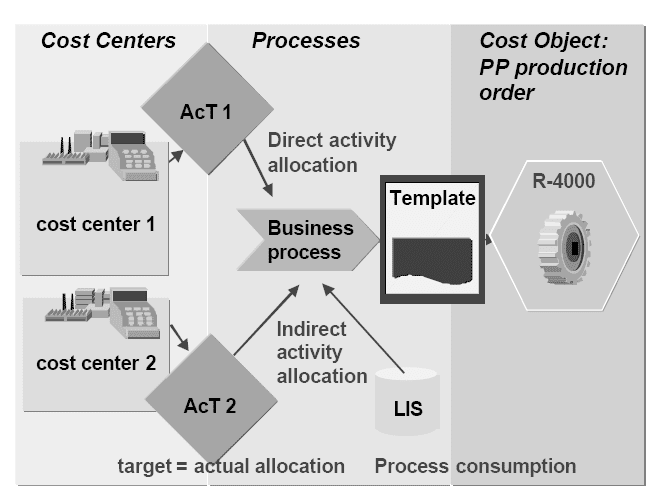 Compared to activity allocations, Template allocation is a much more flexible method of quantity based resource cost assignment.A structured business process template may include cost center/activity types, other processes and other structured business process templates.There are two different types of templates used with processes and each has its own specific and unique purpose. 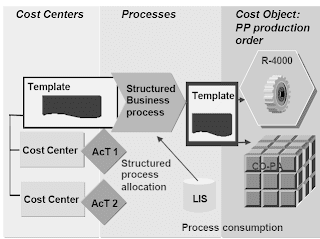 1-The structured business process template defines the resource assignment from cost centers or processes to an ultimate consuming process, based on the actual output quantities of the “top” process. This template is created in environment “SBP” (“Process ínput template”). 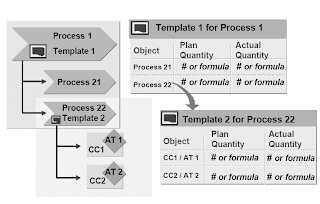 2-The Template is used to allocate process quantities to a cost object that is consuming that process or process group (“Cost object input template”). 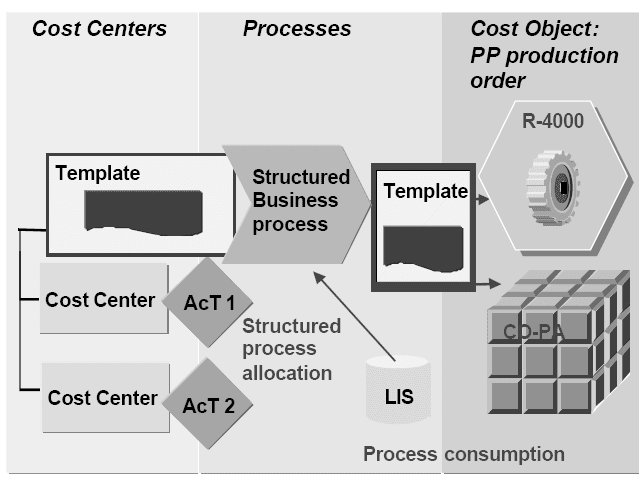 The structured process is a more formal type of process grouping as it contains all the data necessary for automatic allocations of resources from the lower level cost center/activity types and/or processes to the highest level business process in the structure.The structured business process is described by a template created in environment “SBP” which means Structured Business Process. This template is assigned in the process master data record.Each template can contain sub-templates where the lowest level in the hierarchy is on the task level represented by a cost center/activity type. This can be effectively used to model multi-level business process hierarchies.There is a graphical display in process master data. 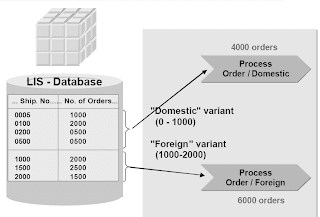 Quantities maintained automatically by other business transactions integrated with LIS may be transfered to statistical key figures and subsequently used in the actual allocation of resources to processes.The processes in the example use as a statistical key figure "Number of orders". The values of these statistical key figures are to be found in an LIS database called an "Infostructure".The master data for the statistical key figures in CO is tied to the LIS key figure "Number of orders" differentiated by an assigned shipment number range as to foreign or domestic orders.In order for the automatic transfer of values from the LIS database to the processes to take place, the specific portion of the LIS database records that really belong to the specific process must be determined. 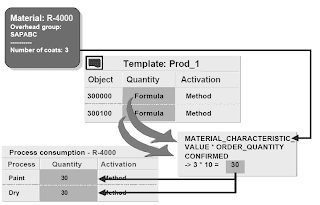 This is done by a variant which is defined to supply only the relevent data from the LIS database required by the specific process.The key figures then serve as a basis for the resource allocation in CO.The template can also pull process driver information directly from LIS without a statistical key figure linked to it. The cost object which uses process resources receives the actual postings from the template allocation. The process consumption quantities may be adjusted manually.Plan template formulas must be reviewed carefully and not simply duplicated and used as the actual template formulas because actual formulas must address actual values. Where “lot size” was appropriate to include in the consumption formula in plan it will probably be replaced with “order quantity” to calculate the actual consumption.Similar to the transaction that applies surcharges to cost objects, processes consumed by a cost object are actually allocated to the specific cost objects by a periodic transaction located in the menu path under period end processing. You find this menu path always in the menu of the receiving objects (application and implementation guide). It is important to perform this processing before period end closing of cost object controlling (wip, variances and settlement). Entering the process directly into the “Object” cell on the template row as shown above.Using template functions to determine the process dynamically as a function of relevant criteria such as plant, profit center, etc. This has the advantage of being able to use the same template row over multiple processes. The cell is set by default to “always active” (by blank). The cell may be set to “never active”. The cell may use the template functions and let the template determine whether it is active for a certain cost object (with Boolean logic).In the above example, a function call in the activation routine accesses the material classification view of the material master of the material being produced and compares the color found there to the fixed value of "stand", meaning standard color. If the material being produced has a color other than "stand” (the result of the Boolean logic is "true”) then the material will need to be painted and subsequently dried, utilizing process resources.Methods for activation of a process are pre-defined and many functions are available for each company‘s unique needs. You can also define own customer functions. 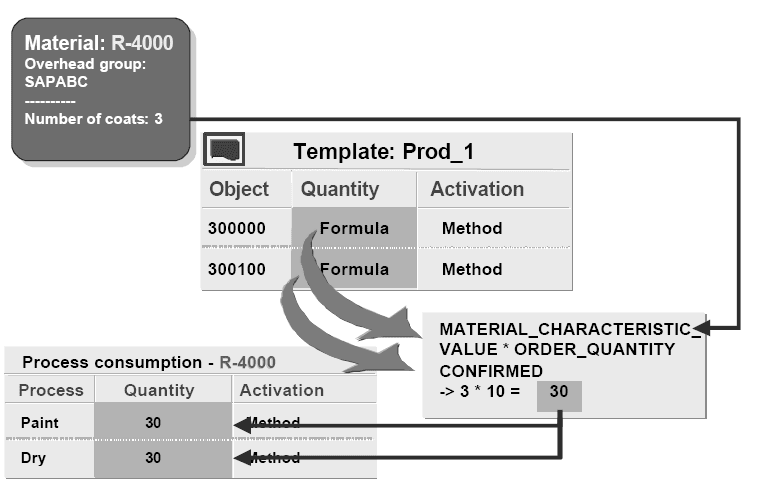 If the process is "active" for the specific cost object, the template next determines what the cost driver parameters are, where they are found, and how to calculate the quantity of the process that will be consumed by the cost object .There will probably be a different quantity formula for actual quantities from the plan quantity calculation. This example multiplies the process driver quantity by the order quantity confirmed. 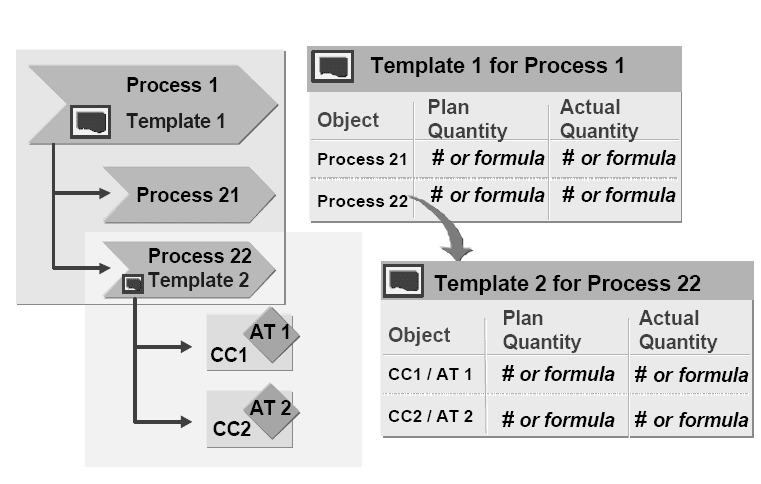 In plan the same process driver quantity was multiplied by the plan lot size.To simplify process template construction, a set of pre-defined functions are available, and user defined functions may be added. Note that for the "Activation" example, the colors were compared, while the cost driver amount in the "Quantity" column requires that the value be included in the calculation.Note also that “order quantity confirmed” will result in a period specific quantity calculation discussed in the previous slide for the actual valuation event of “blank”. 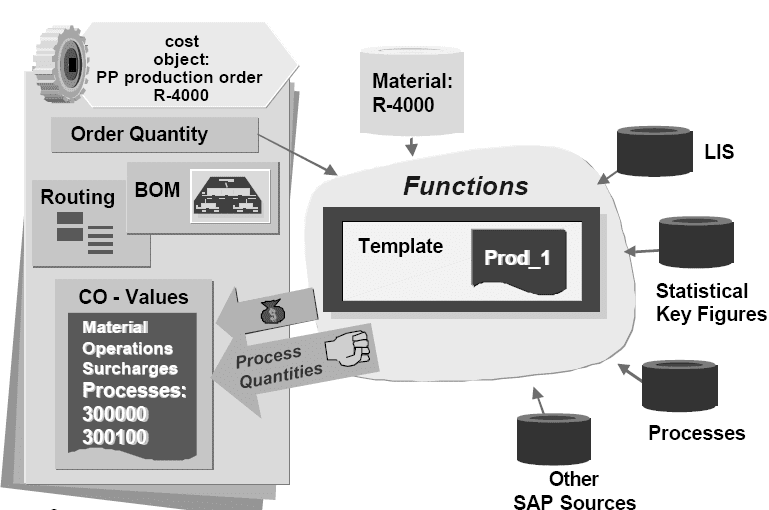 Consumption of processes by a product can be determined by a Template. 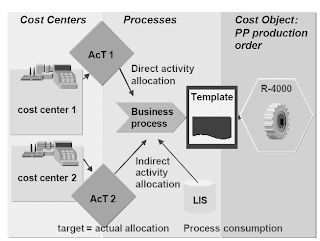 In addition, it is possible to specify process consumption directly in the routing.To do this, you make the following assignments: 1) process to work center , 2) work center to a routing operation.This allows you to post resources from different cost centers to cost objects through a process using one single operation of the routing. The standard values of the routing are used to calculate the process quantity based on PP formulas. The PP confirmation triggers the posting of the processes in the routing real time. Posting of processes not in the routing but in the process template occurs at period end.